Who doesn’t love pizza? With such a wide variety of topping options, there is a pizza for everybody. Personally, I prefer to keep pizza simple with a margherita style. Not only are they easy to make (you only need three toppings) but I love how the fresh basil, tomatoes and mozzarella really shine. Inspired by our Roman Holiday promotion and series of tutorials, I decided to make this pie with a bit of a twist! 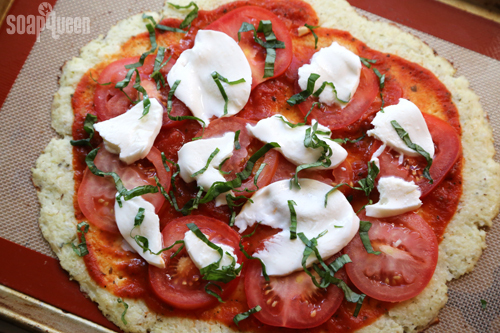 I love to sneak in extra veggies where I can, so for the crust I used cauliflower instead of traditional pizza dough. First the cauliflower is grated, cooked and blended with a little cheese, spices and an egg. This results in a dough like texture, that acts as a great crust! Because cauliflower is moist, you can choose to strain out some of the extra moisture if you prefer a crispier crust. If not, it’s perfect for eating with a fork. ONE: Using a cheese grater, grate cauliflower into a fine texture. Place cauliflower into a heat safe bowl, and microwave for 7 minutes. Cauliflower will have softened. Let cool for several minutes, as it will be very hot! *Note: If you would like a crispier crust, strain cauliflower through a fine mesh strainer once it has cooled. Removing some of this moisture allows the crust to become crispier. If you do not, you will need to eat the pizza with a fork, as the crust is rather moist. Either way is delicious! TWO:Preheat oven to 450. Once the cauliflower has cooled slightly, add parmesan cheese, shredded mozzarella cheese, garlic, oregano, salt and egg. Use a large spoon to thoroughly mix. THREE: Once the mixture has combined, place onto a cookie sheet that has been lined with parchment paper, or that is topped with a silicone baking mat. Create a tight ball with the mixture, then gently press down and begin shaping it into a crust. FOUR: The crust should be about one quarter of an inch thick. Once you are happy with your crust, place into the oven for approximately five minutes, or until the crust begins to slightly brown. 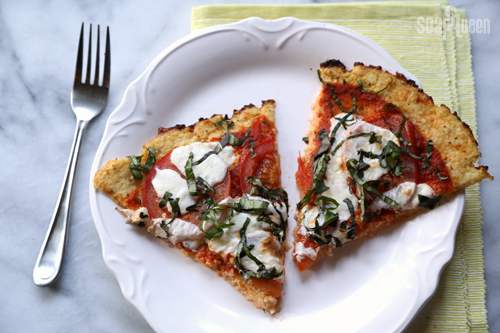 FIVE: Remove crust from the oven, and top with pizza sauce, tomato slices, fresh mozzarella slices and fresh basil. Place into the oven, and let cook for about 12-15 minutes, or until the crust has browned along the edges, and the cheese is bubbling. SIX: Remove from oven, and top with more fresh basil. Let cool for several minutes, cut into slices and enjoy! If you could only eat one kind of pizza for the rest of your life, what kind would it be? Great recipe. How are you supposed to grate the cauliflower? You can grate that up a couple of ways! You can use a cheese grater or chop it up and throw it in your food processor. Either way works well! I made this last night with certain adaptations… my own home made pizza sauce, lots of thinly sliced fresh veggies and topped with mozzarella. It is surprisingly good, although don’t expect the crust to be “doughy” like standard pizza crust. Definitely a knife-and-fork kind of pizza but a real winner in the taste department none-the-less. I have made this kind of pizza crust before, I just use a little EVOO instead of the pasta sauce, but I do put fresh mozzarella, chopped fresh basil, and tomatoes. Sometimes adding grilled eggplant. Yummy! Thank You sooooo much. I am limiting my carb intake and this is great to have an option to have pizza in my life once again. As for my choice of pizza any would do as long as it has onions on it. Given that I think I will slice up a “walking onion” to put on this pizza! I’m glad this recipe helped you out! Question………If you could only eat one kind of pizza for the rest of your life, what kind would it be? This pizza looks great! I think I’ll finally be able to talk myself into eating some cauliflower! That actually sounds awesome, I’m going to try it! I wonder what other vegetables I might try for crust making! I’ve heard of people using zucchini, but I haven’t tried it. Let us know how it goes!